Variegated Flycatchers are native to South America and have had only a hand-full of sightings within the United States. Doing some research on-line, I found that these few birds may have originated from a population at the south end of its range, as they are noted for being long-distance migrants, with a few flying a bit to far. Initial speculation was the bird was a piratic flycatcher. But as word got out that an even rarer bird was on hand, it has become a super star. As of today the flycatcher has been found in the same ficus tree since Saturday. Hopefully it'll hang for awhile longer. Today Bob Pelkey and I arrived about 8:30 am and easily sighted the flycatcher as there were at least a dozen birders surrounding the host tree. After getting our pics we ventured off for other findings. Evergreen Cemetery is a known birding hot spot for migrants and exotics. Earlier this month another rare to our area sulfur-bellied flycatcher was seen in this same location. We added several warblers including Prairie, Black-and-White, Northern Parula, Magnolia, Palms, Cape May and Black-throated Blue. Several unidentified parrots flew over head and a Blue-crowned Parakeet was seen perched atop a neighboring palm tree. 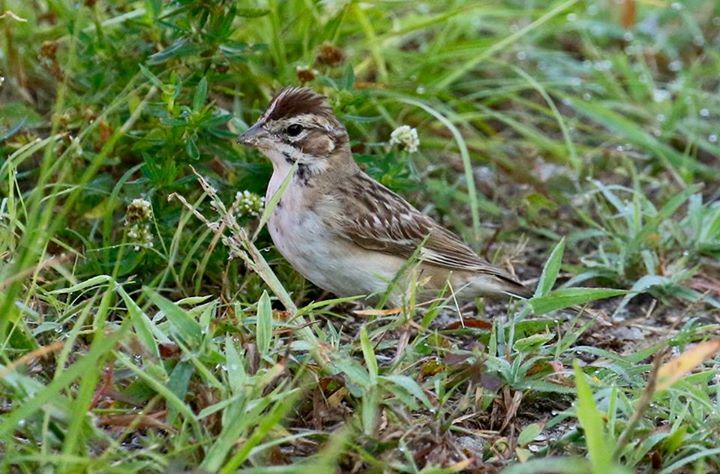 A recent spurt of migration activity in our area, due to less favorable wind conditions for the birds, have many birders heading to their favorite spots. Six-Mile Cypress Slough Preserve has had some improvement lately, but Rotary Park in Cape Coral has been drawing the locals. I followed up at Rotary Park today and had a few good birds, even though many of the migrants seem to have departed last night. Lots of Palm Warblers are present, are Magnolia, Black-and-White, Northern Parula, American Redstart and Black-throated Blue Warblers. The star of the day was a continuing Gray-cheeked Thrush. Eastern Phoebe, Eastern Wood-Pewee and a Great Crested Flycatcher are present as well. Lots of Gray Catbirds have moved in as well. The Audubon Society of Southwest Florida hosts an annual Hawk Watch at the Sanibel Lighthouse each October, which is always lead by master birder Vince McGrath. Lately the event has featured few raptures. This year was no exception. The only raptor to make an appearance, aside from the local Osprey was a Peregrine Falcon that greeted all of as we approached the parking lot. The early sighting of the falcon was considered a good omen for the day, but apparently the winds would be against us. Other birds seen today included lots of migrating Palm Warbler, several Northern Rough-winged Swallows, a Scarlet Tanager and the usual waders and shore birds. In 2008 we had a very good day. The American Kestrel count exceeded 100, plus several Merlins, Peregrines, Osprey and Sharp-shinned Hawks. The next year, 2009, we had sixteen American Kestrels, a dozen Sharp-shinned Hawks a pair of Broad-winged hawks, six Merlins and a few Osprey. The next good event was in 2011 with a pair of American Kestrels, three Merlins, a pair of Sharp-shinned Hawks, a Red-tailed Hawk, a pair of Northern Harriers, a Broad-winged Hawk some Osprey, plus a Scissor-tailed Flycatcher, a Pin-tailed Whydah, an Audubon Warbler and Baltimore Oriole. Bob Pelkey elected to visit the Ding Darling NWR Bailey Tract. Here we added a Blue-winged Teal, more Palm Warblers, a FOS Eastern Phoebe and a Red-shouldered Hawk. Maybe next year would be better. The month of September was very disappointing to those of us that had waited in anticipation for the fall migration. Weather conditions were probably unfavorable for birding in our corner of Florida. Yet that should be good for the birds on their long journey. Yesterday I had spent a couple of hours birding in Cape Coral. First stop was a stack-out location for a recently seen lark sparrow. However it looks like it had already moved on. So I spent time in Cape Coral looking for birds like the Burrowing Owls and Monk Parakeets at the Pelican Boulevard baseball park, Then to Festival Park near Kismet and Chiquita Boulevards. Here were located Florida Scrub Jays, a Burrowing Owl, Eastern Meadowlarks, and an FOS American Kestrel. Then I headed to Six-mile Cypress Slough Preserve in eastern Ft Myers, were I learned that I had missed a very nice mixed flock that consisted of several warblers including a male Golden-winged Warbler. The Golden-winged is a much sought after species as we only see a few each fall. This morning was very much better for those of us who had gathered at Six-mile Cypress Slough Preserve. Most everyone were able to observe a female Golden-winged Warbler, a Lifer for me. Additionally we added a Scarlet Tanager and a Summer Tanager Additional warblers seen by our group included Ovenbird, Worm-eating, Yellow-throated, Common Yellowthroat, Black-and-White, Blackburnian, Northern Parula, Pine, Palm, Prairie, Tennessee, American Redstart, Magnolia, and Chestnut-sided. Some have added Acadia Flycatcher and Swainson's Thrush. 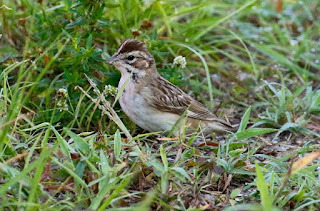 On October first, Charlie Ewell spotted the Lark Sparrow and posted an alert. Seems it only stayed around through the second. Maybe it'll reappear soon.